An act of cruelty is ultimately a failure of the imagination. The experience of reading a book and seeing a movie may have only one thing in common - they are both leisure pursuits. The experiences offered by both could not be more divergent. One engages the imagination and the other presents a fixed imagination melded into plastic. If there was one story that would sledgehammer a wedge between those two experiences, then Atonement is it. The book is beautifully written, with vivid characters and believable and horrific situations. The twists in the narrative are satisfying and you emerge from the experience enriched by this country's foremost exponent of the form. Firstly let me sound contradictory and say that almost every facet of the production is world class. The imagination on offer is sound, the direction assured and the performances strong. The novel's four-act structure (one might think tailor made for translation into screenplay form) is satisfying. In the mid 1930s, a 13 year old girl, Briony Tallis, misreads blossoming sexuality with the effect of ruining a young man's life. The man gets out of jail by enlisting in the army where he strives to get back to his loved one through the horror that was the mass evacuation at Dunkirk in France. The 13 year old, now 18, realises her actions have had catastrophic repercussions and attempts to be forgiven. Its sound dramatic structure should have resulted in a gripping and absorbing movie but somehow (just from my point of view) it came across as glossy and to use marketing parlance, it wasn't sticky enough. It slipped by before me instead of grabbing at my lapels. Emotional attachment slithered off the sheen of the screen and I found myself oddly disconnected. I'm faintly sure it wasn't the class element that put me off ('toffs pout in drawing rooms' is not a genre I can get enthusiastic about but Atonement isn't just that of course). The class structure is suitably disdained in the movie itself. The heroine, Cecilia Tallis played by ex-Pirate Keira Knightley, is suitably aloof and this explicitly pretty actress does well to convince us that she's a confused 23 year old who expects the object of her frustrations and therefore affections to make the first move. Losing his father as a child, Robbie has been brought up by the Tallis family (he's the housekeeper's son) and he's on the road to a successful career in medicine. He's working class and proud of it and on the cusp of a satisfying career. His declaration of love for Cecilia is brought out via a broken vase and when caught making love in the library, my old English teacher's remarks upon a literary work swam back into my brain. Love is a violent, penetrative act. To Briony seeing her sister splayed against the bookshelves like a pressed flower, it must have been truly shocking. Here's where a little modern common sense might have cleared up the matter but no words of explanation could be forthcoming. At least not in 1935. Robbie is next seen retreating to Dunkirk with two other soldiers. He has been imprisoned for three years and has emerged darker and more wary. Played by current UK favourite James McAvoy, the character is a tough one to pull off. How would being imprisoned and sent to war on the pretext of a 13 year old's false testimony affect a man? What parts of his character would be twisted and broken after such an experience and how would an actor convey this? To be flippant, you start with stubble. 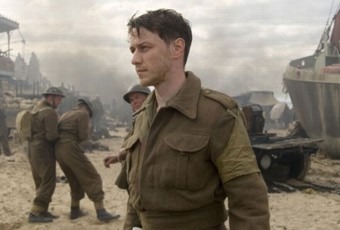 McAvoy's eyes are haunted enough on his slow descent into hell and when he gets there (Redcar's sea front doubling up for Dunkirk's evacuation point), its garish and nightmarish nature serves as a metaphor for everything Robbie has been through. And they're shooting the horses. A lot of press has alighted on the Dunkirk scene as worthy enough for special mention. The uniqueness of it is that it's seven minutes long and all taken in one glorious steadicam shot. The reason for this staging is money or rather lack thereof. There was no time to do the number of set ups (where you reposition the camera, re-light, rehearse and shoot the next shot) so director Joe Wright chose to do the entire 'war is hell' scene in one shot. If there are movie awards for physical fitness then stand up Peter Robertson. Wright requested a fourth take but knees gave out. A steadicam rig is unbelievably heavy (I've worn one and without the camera it's heavy enough) and to maintain this level of designed coverage over 7 minutes is a feat worth celebrating. But again the images were right, McAvoy hit all his marks and the singing and madness were both robust but given all this, the experience just slid off me. Briony is the lynchpin of the piece. It is on her word the movie rests and of course it's her atonement the movie is playing out. Played by the splendidly named Saoirse Ronan and Romola Garai as 13 year old and 18 year old Briony respectively, both seize their moments with a strait-laced relish. Briony Tallis is the very definition of precocious and is gifted with a huge house, servants and all manner of luxuries that most children in pre-war Britain would (and some did) die for. She is also a budding playwright (literally in a pubescent sense) and the only thing she wants for is an adult perspective (and how many 13 year olds have that)? That her older self has realised what her girlish imagination had wrought is a credit to her but even when given a great chance to redeem herself (at a wedding of all places), she drops the ball. Hers is a passive atonement that her even older self (played by the great Vanessa Redgrave) finally acknowledges. One element of the film that did its job with panache and managed to touch me was Dario Marianelli's terrific score. Taking a metronomic cue from the wonderful sound of the clack of Briony's old typewriter keys, Marianelli manages to create a staccato mood within the first few minutes. His orchestrations (I'm assuming 'Dario' is a man's name as in Argento) never engulf the film and neither are they restrained. His is no syrupy strings concoction but a worthy partner to the drama on screen. His is a style that compliments without overwhelming and takes the lovers' plights as far as they can go without over-sentimentality. So, do I recommend Atonement? Do you like sprouts?